Ladies and gentlemen, I have a confession to make. When it comes to cooking meat, I'm a cutter. I'm never confident that the meat I throw on the grill is done, so I cut it open two or three times before I take it off...This method leaves me with meat done to perfection, but it's sliced to bits before it even gets to the table. All that is in the past now that I have joined the digital thermometer revolution. I've been using a digital thermometer for all of my indoor meat creations for almost a year, but it was never really that conducive for my grilling need. My digital thermometer has the temperature gauge and digital unit connected by a 3 foot cord. If I use this while I'm grilling, I'm constantly in and out of the house checking the temperature. It was a pain so I never really took to it. Now, I was fortunate enough to have the opportunity to try a Talking Wireless Digital Thermometer system from Oregon Scientific. The unit itself consists of a temperature gauge attached to a wireless transmitter. While my chicken is cooking outside I have the receiving unit on my counter. All I have to do is set the system to 'Chicken' and wait for the system to tell me it's done . The only problem I had with this little gadget was in the initial setup. I took it out of the package put the provided batteries in the transmitter and the receiver, and put the temperature probe into the chicken. Nothing happened. After a few minutes and some careful reading of the instructions, we were up and running. The receiver actually speaks when your meal is done. I can't wait to use it again, I think we'll have steaks tomorrow night! For more information about this and a wide variety of great Father's Day gifts check out the RedEnvelope website the place for unique and personalized gifts. 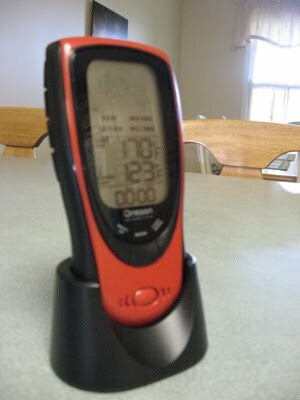 If you want you're own talking wireless thermometer or any other great Father's Day gift from Redenvelope.com and you want to save 10% off your purchase, be sure to use the code '10offred' at check out! I love this gadget so much I'm thinking of buying it for The Mister. Of course I have to buy a grill, too. Ours died last summer. 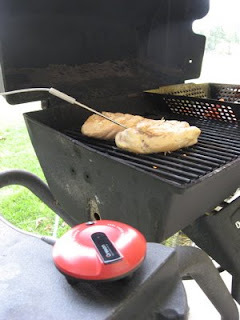 Hallow,,,,Doug Skinner...how are you.this is really great post for me..i have been looking this from somedays.when i find this page i read attentively and gather more knowledge about grill thermometer.it's help us of cooking correct temperature.i like it.